“The Roman god, Jupiter, drew a veil of clouds around himself to hide his mischief. But his wife, the goddess Juno, was able to peer through the clouds and reveal Jupiter's true nature,” as noted in a NASA press release. So, too, is NASA’s Juno space probe revealing the true nature of the gas-giant planet, Jupiter. Episode aired Friday, May 18th and Wednesday, May 23rd, 2018. Brilliant Jupiter, 11 times wider than Earth and 300 times as massive, is now visible in the southeast after sunset. And Jupiter will remain in the evening sky throughout the summer. Even a small telescope reveals dark belts and lighter-colored zones of clouds in Jupiter’s atmosphere. Jupiter rotates very quickly, about once every 10 hours. This rapid rotation deforms the planet, creating a pronounced equatorial bulge. Jupiter’s fast rotation also drives powerful easterly and westerly jet streams that propel Jupiter’s zones and belts at differential speeds of up to 340 miles per hour. This creates giant rotating storms like the Great Red Spot. Gravity measurements from the Juno spacecraft, which has been orbiting Jupiter for nearly 2 years, have shown that Jupiter’s atmosphere extends to a depth of 1900 miles, and that this atmosphere weighs more than 3 times the entire weight of the Earth! Due to our angle of view, Jupiter’s poles cannot be seen well from Earth, even with the most powerful telescopes. But Juno follows an elliptical orbit over Jupiter’s poles, coming within 3000 miles of Jupiter’s cloud tops. Juno has been able to return amazing views of persistent, rotating cyclonic storms in both north and south polar regions. Below 1900 miles, Juno has revealed that Jupiter rotates more like a rigid body. Surprisingly, preliminary gravity data indicate that Jupiter may not have a solid rocky core. Below Jupiter’s atmosphere, a liquid mantle of very highly compressed hydrogen and helium may have dissolved a solid core, if one ever existed. 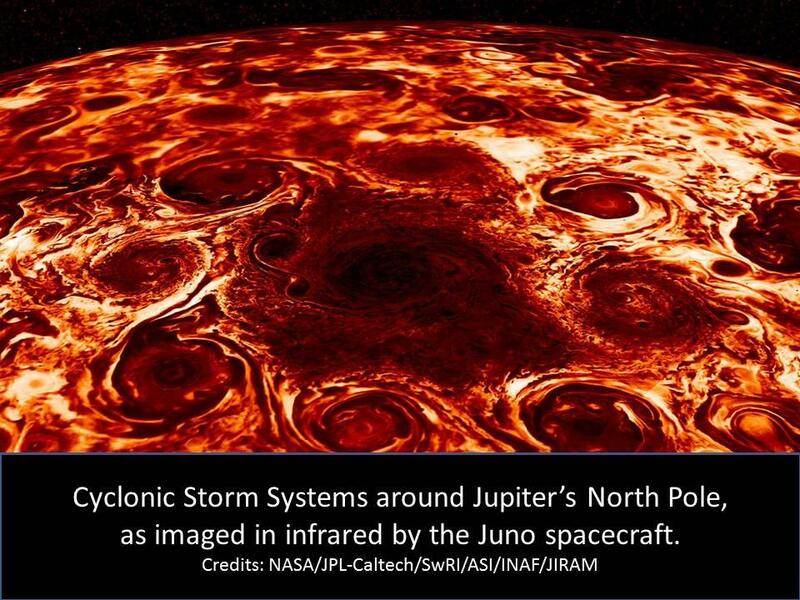 But stay tuned; future data from Juno may change this picture. During coming months, do take a look at Jupiter, especially through a telescope at one of this season’s public astronomy events. Jupiter’s belts and zones and the changing positions and eclipses of its four largest moons are sights to behold!